I am not a wine drinker, but I know it would certainly be unusual to put Thailand and wines in the same sentence. I’ve heard of French wines, Indian wines and even South African wines, but I wouldn’t peg Thailand as a wine producer. So imagine my surprise when I found a vineyard in a place that’s claim to fame is its endless seaside and vast expanses of pristine beachfront. However, don’t dismiss Thailand’s foray into wine production just yet. While they haven’t entered the league of top winemakers in the world, they have definitely proved that they can produce good quality wines in a region that the world couldn't imagine to be conducive to grape cultivation. The discovery that wine production was possible in Thailand came about over 30 years ago, when a royal project under HM the King began experimenting with grape plantation in the region. 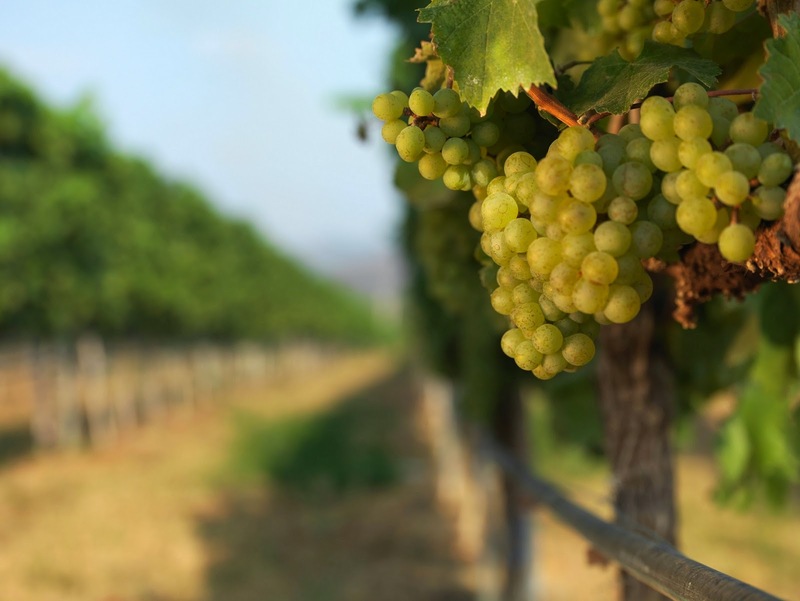 That’s when they realised that Thailand’s Mediterranean climate would aid the successful cultivation of grapes. 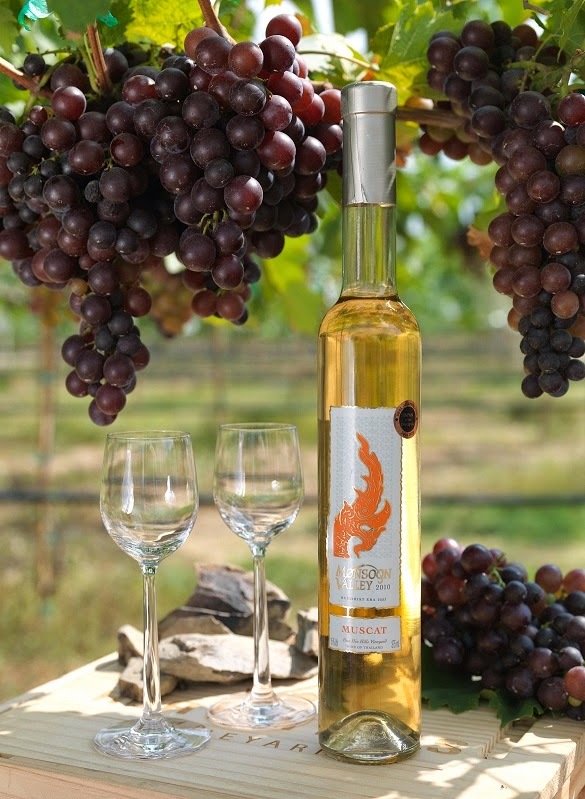 This eventually led Siam Winery to give Hua Hin its first boutique vineyard. Today, Hua Hin Hills boasts of growing over 30 grape varietals that include the Colombard, Summer Muscat, Sangiovese, Tempranillo, Hua Hin Hills’ on their loamy sand and slate terrain. 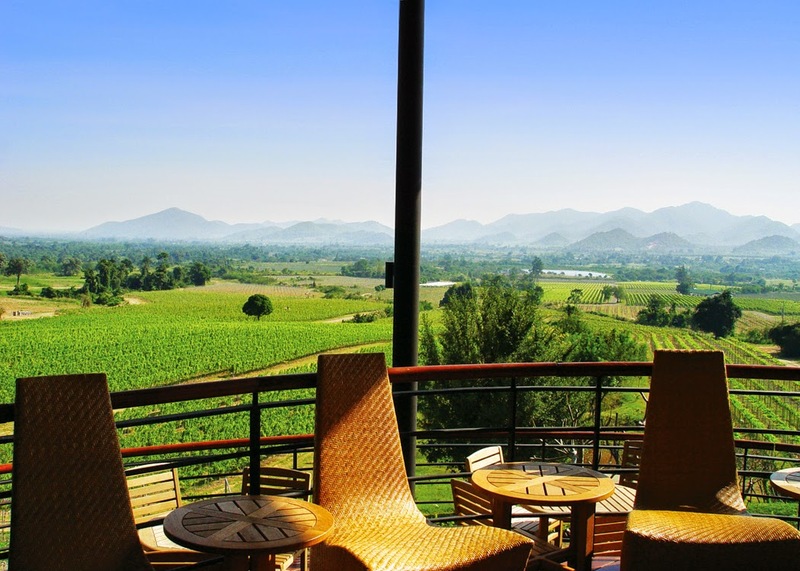 Spread over 560 acres, the vineyard is also home to the Sala Wine Bar and Bistro—which contains a wine bar, retail shop, wine cellar and a meeting facility—where you can learn more about oenology, viticulture, and the detailed story behind the conception of latitude wines in Thailand. Sala, also known as an open pavilion, is a facet of Thai architecture that is meant to be open on all four sides and provide shade, while protecting people from climatic conditions like rain. The bistro is designed using materials like bamboo and red bricks and looks over the lush green rows of grape-bearing vines. The menu here not only allows you to sample their fine wines, but also offers delicious local food prepared with ingredients grown within the property. You can also request the staff to help you pair your food with their selection of wines. Those who don’t drink alcoholic beverages can choose from alternative grape-based concoctions such as the ever-popular red grape juice, grape smoothie and hot grape tea. People with a sweet tooth must try their grape sorbet and grape yoghurt cheesecake. 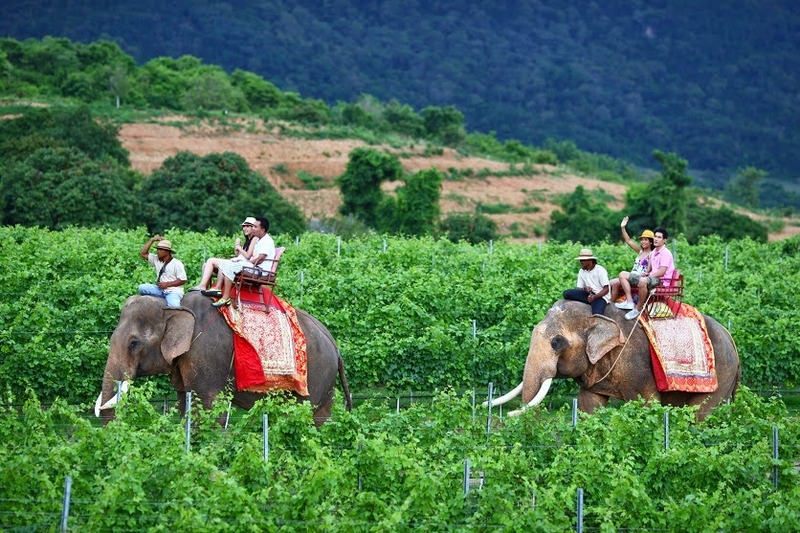 However, what makes this vineyard truly ‘Thai’ is the surprising element of elephant rides. Imagine being able to explore a grape plantation seated atop an elephant. Where else but Thailand can you think of doing this? The activities here include wine tastings, elephant rides, cycling, jeep tours and wine and tapas pairing. The vineyard is open from 8:30am to 6:30pm. For more information, check out their website. If you’re planning a trip to Hua Hin, do check the official Thailand Tourism website before you go so that you can prepare your itinerary in advance. As for flight tickets, I quite like Thai Airlines. The service is always good and the tickets are fairly reasonable. P.S. My visit to Hua Hin, Thailand was at the invitation of the Tourism Authority of Thailand. Thank You Gaurav. Yes, I was :) I guess you may have arrived after us and your itinerary was a bit different. Tourist places in Delhi India visit give tourists an opportunity to experience the vibrant nightlife of this old city, with a wide variety of entertainment options. The tradition continue even today, as Delhi wakes up to speckled beats and moves of the nighttime revelers, as night sets in. Your blog has caught our attention thanks to the quality of your posts. We would be delighted if you would join us on www.smartindianwomen.com . walks of life at par status and a platform to recognize their efforts and express their opinions. Hi , Thailand is such a amazing place . Thanks for these fabulous pictures . Great work . Thanks Arushi for your kind words, I will certainly email you. And thank you Mansarovar Yatra. Thailand is truly beautiful and surprisingly unexplored. Wow! Seems like a fun place. No one knew that Thailand too covers a wide variety of grape cultivation. The successful experiment to check the possibility of grape plantation 30 years ago paved way for wine production in Thailand.